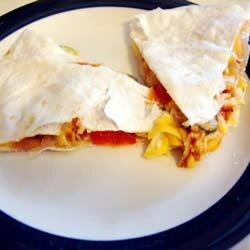 "Part pizza, part quesadilla, this snack sandwiches cheese, sauce and toppings between two flour tortillas. My kids have fun cutting the finished pie into slices like a traditional pizza." Place one tortilla on a sheet of waxed paper sized to fit in your microwave. Spoon 2 tablespoons each of Cheddar and Mozzarella cheeses over the tortilla. Cover the cheese with turkey slices. Spread 1 tablespoon of pizza sauce over the turkey, and top with 1 tablespoon each tomatoes, black olives, and green peppers. Sprinkle with remaining Cheddar and Mozzarella cheeses, and place second tortilla on top. Place on a microwave-safe plate, and cover with a sheet of waxed paper. Cook on High in microwave until the cheese melts, about 1 1/2 minutes. Allow to cool 2 minutes before cutting into wedges. This was okay, I'd rather have a real pizza. I used some sliced serrano peppers on mine, instead of green pepper. I probably won't make again, but thanks for letting me try this out. i did'nt think this would be something i would want for myself ,but my grandson liked it. Made for a great yet quick lunch for me. I left out the olives but added jalapenos instead. Thanks, Nurse Ellen!